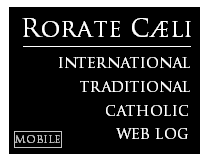 RORATE CÆLI: Socci: "At the End of the Synod, Francis may impose his will, Diktak-style -- but Bergoglism is foundering everywhere"
Socci: "At the End of the Synod, Francis may impose his will, Diktak-style -- but Bergoglism is foundering everywhere"
“Is the audacious war-machine beginning to wane?” a Swiss Vatican reporter asks. Actually, the Argentinian war-machine with the German engine has gotten stuck in the mud at the Synod. Lately we have heard that German “engines” are being put on the scrap-heap plus the Argentinean bodywork is an old wreck of Peronism and rusty Liberation Theology. For the Bergoglio and Kasper party the defeat will be even more stinging on the subject of homosexuality, given that from the reports of the various groups, there emerges an appeal to oppose vigorously the gender theory, considered the latest dangerous ideology substituting Marxism, with devastating effects on the mentality and formation of the young. In effect, the Catholic part of the Synod, (the one following perennial teaching along the lines of John Paul II and Benedict XVI) in the majority numerically, has made energetic protests against the Bergoglian minority in power, which is imposing its procedures, its methods and its men in key posts. But nothing is heard of these protests outside [the Synod Hall] or they are misrepresented by the propaganda machine in caricature form (the bad conservatives against the illuminated progressives). Although the Synod is discussing the family, those millions of families who are on the outside – according to Bergoglio - needn’t know anything (unlike other Synods) or they need to have the information filtered or “packaged” for them. The members of the Bergoglian party are like a football team which is losing 5 -0 on the soccer field but can deliver kicks with impunity, try to score hand-goals (another Argentinean way) or display arrogance because they know that the referee is their leader and in the end will award them the match by even going against all the rules (indeed, Bergoglio reserves the right to change the rules during the match itself – based on his team’s convenience – take for example, the final report). Ratzinger today is heeded more and more, since defenseless Truth is the only treasure of the Church, Christ Himself, and if the Church sells out on the truth of Catholic Doctrine, She would be like Judas and would take away from humanity the true mercy and salvation of God . Illuminated by Benedict’s light, the Catholic part arrived at this Synod stronger and better-prepared with respect to the last one and to the Consistory of February 2014, when it was taken in surprise by Kasper’s unspeakable theses that Bergoglio allowed him to proclaim. Furthermore, it is significant that among the most determined to oppose the subversion of Catholic Doctrine, we have the young African Church, which was especially taken care of for 40 years by John Paul II and Benedict XVI. Besides having great cardinals like Sarah, a light for all of Christendom, the African Church is by far the most dynamic one, the most missionary one and the one with most growth, having now exceeded the 200 million faithful, with a striking 238% more in respect to 1980. Whilst the South American Church of Bergoglio, the German one of Kasper and the Belgian one of Danneels are about to collapse. Yet this is today’s paradox: in the leadership of the Church we have those whose ‘recipes’ have been shown to be disastrous in their countries. And yet they still want to apply the same disastrous recipes to the entire Church, resulting in devastating effects on a planetary scale. True, many indicate the Pope’s popularity as a sign of rebirth. However this is a bluff and is now understood as such inside the Church. It is the drugged popularity from the circus of the secular mass-media, where there is not even one conversion, but on the contrary, delight, about the Pope’s conversion to the agenda of Obama and the United Nations. The data in Italy about Catholic practice, which under John Paul II and Benedict XVI had grown, continues to weaken under Bergoglio. “La Repubblica” itself, last Saturday, referring to the studies of the “Foundation for Liberal Criticism” (“Fondazione Critica liberale”) and of the CGIL (a leftist union) had to acknowledge that for the Church “there is no Francis effect” , actually, “Italy continues to distance itself from the Church” , so indeed, there is the Bergoglio effect - the other way around though – he drives the faithful away. Catholics have the sensation that with Bergoglio everything is collapsing. For instance, Monsignor Charamsa ‘s embarrassing ‘coming out’ (along with his companion), who expects the Church to change the law on homosexuality based on the word of God, would not have been possible without the hundreds of disconcerting apertures and who-am-I-to-judges from Bergoglio, whom Charamsa defines as “fantastic”. Whoever sows the wind, reaps the whirlwind, as the Bible says. And how do we avoid the confusion and disorientation from Bergoglio’s Motu Proprio on marriage annulments, which was even demolished by Professor Danilo Castellano, a Catholic lawyer? It is impossible not to see that it introduces de facto divorce, subverts the Gospel and the two thousand year teaching of the Church. So then – instead of sustaining the family under attack by modern ideologies – this Motu Proprio gives it the death-blow. Then, there is the long list of Bergoglian errors. The one on immigration is enormous. Like the one concerning the persecuted Christians, who certainly didn’t benefit from his position of surrender to Islam and the Communist regimes. Then, we have the Christians massacred by ISIS whom he has effectively abandoned by delegitimizing every concrete intervention in their defense: in fact today the bishops of the Middle East (and their communities) see in Putin’s intervention, the hope of liberation from terror. Then, there are Bergoglio’s no-global meetings against “an economy that kills” (the capitalist one). According to data from FAO diffused recently, the percentage of the under-nourished in under-developed countries has passed from 23.3% in the year 2000 to 12.9% today. In 50 years the global ratio of extreme poverty has passed from 80% to 10%, while world population has doubled (the opposite from what the Malthusian theories predicted). Even the figures on the environment, the air and health have very much improved over the past 50 years, disproving Bergoglio’s eco-catastrophic-Marxist encyclical. 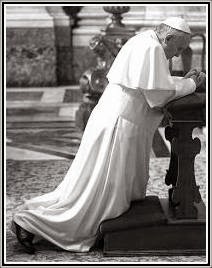 Even what is celebrated as Bergoglio’s International success – the end of the embargo in Cuba – on closer inspection – results in being the rescue of an old, detestable and bloody dictatorship which the Pope went to pay homage to, ignoring its victims and dissidents. Bergoglio is leaving behind a panorama of destruction along with incredible slips like the extraordinarily comical quarrel with Ignazio Marino* something unimaginable for giants like Ratzinger and Wojtyla (notwithstanding Scalfari who praises Bergoglio because he took the Church out of politics).